The 2016 foray will be based at Glenorchy Hall in the town of Glenorchy, providing ready access to the forests of Mt Aspiring National Park. Glenorchy is 46 km / 43 min drive north of Queenstown. Cell phone coverage at Glenorchy and Queenstown is good. There are petrol stations in both Queenstown and Glenorchy (Queenstown will be cheaper). The foray will begin on Thursday 5 May evening, arrive at Glenorchy Hall from 5 pm Thursday to set up the Hall, This first night it will be up to the individual to organise their own dinner. The foray programme will involve daily collecting, identification, and provision of display tables of the day's finds. The FUNNZ AGM will be held on the evening of Saturday 7th May, and a group photo will be taken before the dinner on Friday 6th May. For overseas participants, please correspond with us so that we can advise internal travel options. The nearest airport is at Queenstown. A charter bus is organised between Queenstown and Glenorchy on the 5th and 9th of May. The cost will be around $20 per person each way. There is a bus between the airport and Queenstown every 15 mins for $12, take the Route 11 bus. Abstracts should be submitted to Bevan Weir by 31 January 2016. download the abstract template. If you are attending this it needs to be booked separately from the Foray. If you are attending the AMS / FUNNZ conference, you may wish to stay on at Rydges Lakeland Resort Queenstown in Queenstown and drive up to Glenorchy each morning (our room rate at Rydges is $129 per night). We are self-catering for breakfasts and lunches, this will be done in the Hall each morning. There will be a roster for setting out the food and cleaning up breakfast and dinner. Dinners will be at the Glenorchy Hotel and backpackers. Please indicate on the registration form if you have any special dietary needs (vegetarian, lactose-free, gluten-free etc.). The caterers will endeavour to fulfil special meal requirements if these are advised in advance. The prices for attending the foray are listed in the table below. Note that you will have to book your own accommodation. Please register by completing the secure registration form online at https://www.funnz.org.nz/forays/registration by 31 March 2016. An email will give you immediate confirmation of your registration. In the event that you cannot use the online system please email Bevan Weir. You do not need to be logged into the website to register. Each person needs to complete a separate registration, but payment can be combined. Payment for the foray is not due until 1 March 2015 (the beginning of the FUNNZ financial year). Everyone who registers will be sent payment details after that date. Payment by internet banking is strongly encouraged. A cash payment at the foray is fine for international visitors. Cheques are also accepted. Details on how to pay will be sent to you by email. If you need to later cancel, there is a 100% refund of fees if notifying cancellation before 31 March, 90% if before 18 April. Penalties for late cancellation arise because of commitments of expenditure for accommodation and food. Receipts will be issued at the foray. They will only be posted if specifically requested. Membership of this organisation for 2015 is due in March; usually membership is paid along with the foray expenses. Membership provides a 10% discount on the cost of the Fungal Foray. The cost of membership is $15 waged and $10 unwaged. 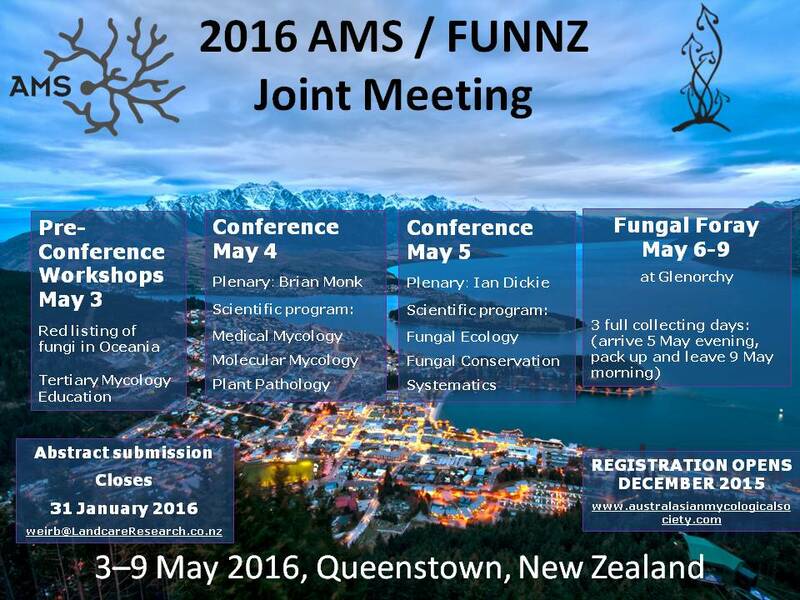 The FUNNZ website carries information about upcoming and previous mycological events.